The green light on this washer indicates it’s available for use. Blue means “reserved,” and orange means “unavailable.” The equipment is all operated by customers using the Washlava mobile app. 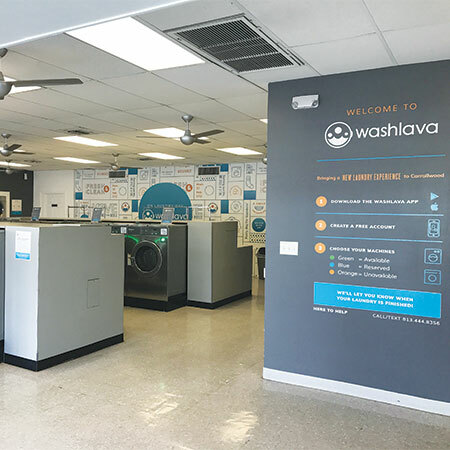 TAMPA, Fla. — Washlava, the mobile technology startup modernizing Laundromats through its patent-pending machine-integrated technology platform and corresponding mobile application, reports it has launched the world’s first exclusively app-enabled Laundromat here. 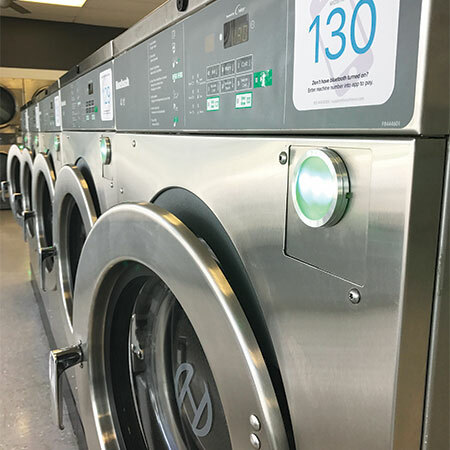 The Washlava-branded Laundromat in Tampa’s Carrollwood neighborhood is now completely coin and cashless, with the store’s Huebsch laundry equipment being controlled through the Washlava mobile application. “By eliminating quarters and cash, we can provide customers with a safer, faster, more convenient laundry experience,” says Todd Belveal, serial entrepreneur and Washlava owner, founder and CEO. In addition to enabling mobile payments, the technology allows customers to find Washlava locations, see machine availability, reserve washers, and receive push notifications when their laundry is finished. In operation at the University of Florida since fall 2016, students there prefer the app 12 to 1 over quarters and 7 to 1 over credit cards, Washlava claims. The Tampa-based team of five is partnering with other Laundromat owners to roll the technology out to other locations and is working with laundry equipment providers to install it in multi-housing environments like college dorms and apartments. Washlava is preparing for its technology to launch at Laundromats in New York, Austin, Washington, Los Angeles, San Francisco and Miami. “Our technology enables a better, more modern and convenient experience for customers, and more efficient, profitable locations for laundry owners,” says Belveal. Its platform is now available on LG Giant, Huebsch® and Speed Queen® Quantum® commercial laundry equipment, with additional makes and models coming soon, the company says.